With increasing age, naive CD4 T cells acquire intrinsic defects that compromise their ability to respond and differentiate. Type I IFNs, pervasive constituents of the environment in which adaptive immune responses occur, are known to regulate T cell differentiation and survival. Activated naive CD4 T cells from older individuals have reduced responses to type I IFN, a defect that develops during activation and that is not observed in quiescent naive CD4 T cells. Naive CD4 T cells from young adults upregulate the expression of STAT1 and STAT5 after activation, lowering their threshold to respond to type I IFN stimulation. The heightened STAT signaling is critical to maintain the expression of CD69 that regulates lymphocyte egress and the ability to produce IL-2 and to survive. Although activation of T cells from older adults also induces transcription of STAT1 and STAT5, failure to exclude SHP-1 from the signaling complex blunts their type I IFN response. In summary, our data show that type I IFN signaling thresholds in naive CD4 T cells after activation are dynamically regulated to respond to environmental cues for clonal expansion and memory cell differentiation. Naive CD4 T cells from older adults have a defect in this threshold calibration. Restoring their ability to respond to type I IFN emerges as a promising target to restore T cell responses and to improve the induction of T cell memory. With advancing age, the immune system loses competence to generate adaptive immune responses (1–5). Mortality and morbidity from infections increases; >90% of all influenza-related deaths in the United States occur in older adults (6). In particular, older individuals are more prone to develop complications from newly arising infectious organisms, such as in West Nile fever or severe acute respiratory syndrome (7–12). Vaccinations are powerful interventions that have been extremely successful in changing the natural history of infections in the young and, therefore, should be ideal tools to promote healthy aging. Considerable effort has gone into annual influenza vaccinations; however, the induction of protective immunity elicited by influenza and other vaccines remains inadequate in older adults (13–16). Despite increasing compliance with vaccine recommendations, the annual influenza epidemics remain a medical challenge (17). A better understanding of the age-associated defects in adaptive immunity holds the potential to design age-targeted interventions to improve vaccine responses (3, 18). Given the dramatic decline in thymic T cell production in humans, older individuals have been suggested to lack a sufficiently diverse TCR repertoire to respond to the universe of foreign Ags, which would make it difficult to improve vaccine responses (19, 20). Although initial studies in the mouse and in humans supported this concept (21–23), recent studies have led to the conclusion that T cell generation and homeostasis is different in humans and mice (24). Moreover, recent estimates of human TCR richness by next-generation sequencing have shown an unexpected complexity of the human repertoire, even in older individuals, which makes frank holes in the repertoire an improbable explanation for the age-associated T cell defect (19, 25). T cell homeostatic proliferation appears to be efficient to maintain not only T cell numbers but also TCR diversity, in particular for human CD4 T cells that are important for vaccine-induced Ab responses (26). As an alternative to contraction in TCR diversity, increasing dysfunctionality of naive T cells could explain defective vaccine responses (27–30). Age-associated defects could occur at the level of initial T cell activation or the level of subsequent clonal expansion into differentiated effector cells, or could impact the ability of T cells to survive as long-lived memory cells. Gene expression studies comparing naive CD4 T cells from young and older individuals after stimulation with the superantigen toxic shock syndrome toxin (TSST) and myeloid dendritic cells (DCs) suggested that the ability to respond to strong stimuli was preserved (31). In addition, aged human CD4 naive T cells were able to be activated by novel Ags and were able to produce IL-2 when stimulated with rabies virus or Etr proteins from tick-borne encephalitis virus (32). However, suboptimal stimulation uncovered a heightened TCR activation threshold because of overexpression of the dual specific phosphatase 6. The associated blunting of ERK phosphorylation may compromise the response to low-affinity Ags (33). The current study was designed to examine pathways that are operational several days after initial Ag encounter when naive CD4 T cells differentiate and develop into effector and memory T cells. The study was also designed to identify defects in these pathways that might contribute to suboptimal vaccine responses in older adults. In initial gene expression arrays on day 3 after activation with DC/TSST, we observed a signature of type I IFN-inducible genes in young naive CD4 T cell responses that were reduced in older individuals. In this study, we show that CD4 T cell priming is associated with sensitization of STAT1 and STAT5 responses to IFN-α. This increased sensitivity of activated CD4 T cells is attenuated in older adults. Because type I IFN responses regulate T cell survival and migration, the signaling defect in activated CD4 T cells may contribute to the impaired adaptive immune responses. PBMCs were obtained from eighty-seven 20–35-y-old adults and eighty-six 65–85-y-old adults. Individuals with acute diseases, current or previous history of immune-mediated diseases or cancer, except limited basal cell carcinoma or chronic diseases not controlled with oral medications, were excluded. The study was approved by the Stanford Institutional Review Board. CD4 naive T cells were purified from PBMCs by negative isolation of total CD4 T cells using a CD4+ T Cell Isolation Kit II (Miltenyi Biotec) followed by depleting of CD45RO+ cells. In some experiments, T cells were isolated from peripheral blood with Human T Cell Enrichment Cocktail (STEMCELL Technologies). To generate DCs, CD14+ monocytes were positively selected by anti-CD14 magnetic microbeads (Miltenyi Biotec) and then cultured with 800 U/ml GM-CSF and 1000 U/ml IL-4 (R&D Systems) for 6 d. DCs were matured with 1100 U/ml TNF-α (R&D Systems) and 1 μg/ml PGE2 (Sigma) for 24 h. For DC–T cell cocultures, 25 × 103 naive CD4+ cells were stimulated with 0.5 × 103 DCs and 0.1 μg/ml TSST-1 (Toxin Technology) for 4 d. Cell and TSST concentrations were chosen to minimize alloreactive responses and to keep stimulation conditions suboptimal. Alternatively, purified naive CD4 T cells were stimulated with Dynabeads human T-expander CD3/CD28 (Life Technologies) for 3 d.
Total RNA was isolated using Trizol (Invitrogen Life Technologies), and cDNA was synthesized using AMV reverse transcriptase (Roche Applied Science) and random primers. Transcripts of target genes were quantified by SYBR quantitative PCR (qPCR). The primers used for qPCR were: IFIT1: 5′- GCAGAACGGCTGCCTAATTT-3′ and 5′-TCAGGCATTTCATCGTCATC-3′; OAS3: 5′-GTCAAACCCAAGCCACAAGT-3′ and 5′-CTCCTTCCACAACCCCTGTA-3′; STAT1: 5′-ACCTTGCAGAACAGAGAACAC-3′ and 5′-GGCATTCTGGGTAAGTTCAGT-3′; STAT5A: 5′-GCAGCCAGACCTATTCCTCCT-3′ and 5′-TCTCTTAGGAGGGCAAAGCT-3′; STAT5B: 5′-CGACCTCTCCATCTTCAGCT-3′ and 5′-CACAAACACATACTCGCACT-3′; PTPN6: 5′-TCAAGGTCATGTGCGAGGGT-3′ and 5′-CCTCGTGGCATAGTACGGCTG-3′; SOCS1: 5′-TTTTCGCCCTTAGCGTGAAGA-3′ and 5′-GAGGCAGTCGAAGCTCTCG-3′; SOCS3: 5′-GGCCACTCTTCAGCATCTCTGT-3′ and 5′GCATCGTACTGGTCCAGGAACT-3′; PIAS1: 5′- AACCCACCAGTCTAGCATC-3′ and 5′-GGAAGTGATCTTCTTGTGGAC-3′; PIASy: 5′-AGCTGTGCAAGGCACTGGTCA-3′ and 5′-GCTTCTTCTCGTTCATCTGCAG-3′; 18s rRNA: 5′-GTTGAACCCCATTCGTGATG-3′ and 5′-GCCTCACTAAACCATCCAA-3′. Results were compared with qPCR of serial dilutions of gene-specific standards to determine transcript numbers and were normalized to 1 × 106 18s rRNA transcripts. Unstimulated or activated CD4 naive T cells (stimulated with anti-CD3/CD28 Dynabeads for 3 d) were stimulated with 10,000 U/ml IFN-α (PBL Assay Science) at 37°C. Cells were fixed in BD Cytofix fixation buffer; permeabilized with BD Perm Buffer III; and stained with anti-CD4-PerCP, anti-phospho-STAT1 (pY701)-FITC, or anti-phospho-STAT5 (pY694)-APC. For intracellular staining of IL-2, activated CD4 naive T cells were restimulated with Dynabeads human T-expander CD3/CD28 in the presence of brefeldin A for 6 h. Cells were stained with anti–CD4-PerCP, fixed with BD Cytofix/Cytoperm buffer and then stained with anti–IL-2–FITC. Apoptosis was assayed using a BD Annexin V PE Apoptosis Detection Kit I following procedures suggested by the manufacturer. All flow Abs and buffers were from BD Biosciences. IFNAR surface staining was performed using anti–IFNAR1-PE or anti–IFNAR2-PE (PBL Assay Science). Cytometry data were collected with an LSRII flow cytometer and analyzed with FACS Diva or FlowJo software. Unstimulated and activated CD4 naive T cells were lysed in lysis buffer containing proteinase and phosphatase inhibitor cocktails (Cell Signaling Technology). Lysates were electrophoresed on a 9% SDS-polyacrylamide gel and then transferred to a polyvinylidene difluoride membrane (Bio-Rad Laboratories). The blots were blocked and probed with anti–phospho-STAT1 (pY701), anti-STAT1, anti–phospho-STAT5 (pY694), anti-STAT5, anti-SOCS1, anti-SOCS3 Ab (all from Cell Signaling Technology), and anti–SHP-1 Ab (EMD Millipore). For immunoprecipitation, lysates were precleared with protein G agarose beads (Santa Cruz Biotechnology) at 4°C for 1 h followed by incubation with anti-human IFNAR1 Ab (PBL Assay Science) at 4°C overnight. The immune complexes were captured by protein G agarose beads and then subjected to blotting assays using the Abs described above. CD4 naive T cells were activated with anti-CD3/CD28 mAb for 3 d followed by 10,000 U/ml IFN-α stimulation for 5 min. Cells were fixed with 4% paraformaldehyde, permeabilized with 0.05% Triton X-100, and incubated with rabbit–anti-SHP-1 and mouse–anti-human IFNAR 1 Abs at 4°C overnight. After washing, cells were incubated with Alexa Fluor 488–labeled goat anti-rabbit and Alexa Fluor 594–labeled goat anti-mouse Abs (Life Technologies) at room temperature for 1 h. Cells were then subjected to confocal microscopy. Images were captured using a LSM710 microscope system and analyzed with ZEN 2010 software (Carl Zeiss). Comparisons were performed with two-way ANOVA or t test, where appropriate, using SigmaStat 3.0 software. In comparing gene expression in CD4 T cells from young and older individuals after stimulation with the superantigen TSST and DCs from a young individual, we identified several signatures of differentially expressed genes on day 3 after stimulation (31, 34). As previously reported, gene ontology enrichment analysis using the David Bioinformatics Resource tool (35, 36) showed enrichment for gene ontology terms associated with zinc binding and transportation for genes overexpressed in old, activated naive CD4 T cells. Conversely, probes with reduced expression in old CD4 T cells were significantly enriched for genes that are controlled by an IFN response element (ISRE; p < 10−17). Among others, these genes included classical type I IFN-inducible genes such as IFIT1, Mx-1, and various OAS variants (data not shown). To confirm this observation, we stimulated purified naive CD4 T cells from eighteen 20–35-y-old and eighteen 65–85-y-old individuals with TSST and monocyte-derived DCs for 3 d and assessed the transcription of the ISRE-regulated genes IFIT1 and OAS3 (Fig. 1A). Transcripts of both genes were significantly higher in the activated T cells from young individuals. 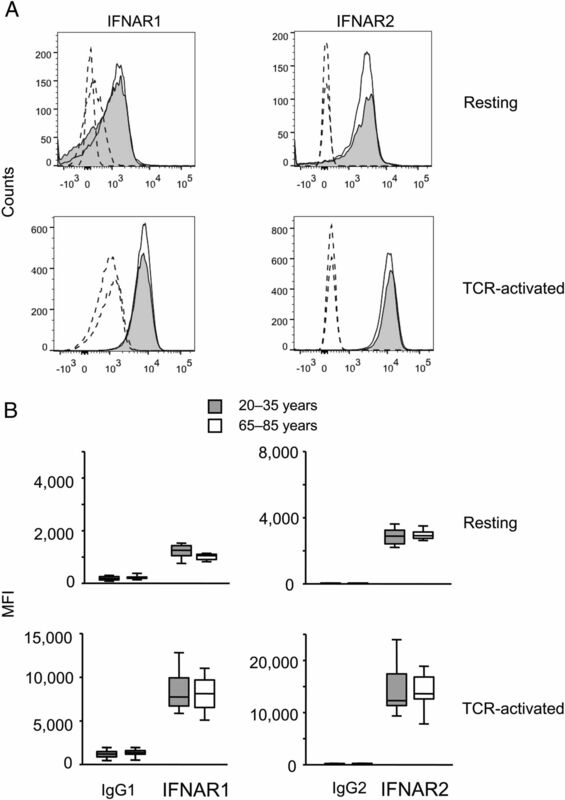 Expression of ISRE-responsive genes in activated CD4 naive T cells declines with age. IFIT1 and OAS3 expressions were quantified by qPCR. Transcript numbers expressed relative to 1 × 106 18s RNA transcripts from 20–35-y-old adults (shaded boxes) and 65–85-y-old adults (open boxes) are shown as box plots with medians; 25th and 75th percentiles are shown as boxes, and 10th and 90th percentiles are shown as whiskers. (A) Purified naive CD4+ T cells from young (n = 18) and older (n = 18) adults were stimulated with the superantigen TSST and DCs. IFIT1 (left panel) and OAS3 (right panel) transcripts were quantified on day 3 of culture. (B) CD4 naive T cells were stimulated with Dynabeads human T-expander CD3/CD28 in the presence of indicated concentrations of IFN-α for 3 d; IFIT1 expression was quantified using qPCR. Data are from 12 young and 12 older adults. (C) Unstimulated (left panel, n = 10) and activated naive CD4 T cells (right panel, Dynabeads human T-expander CD3/CD28 stimulation for three days; n = 13) from young and older adults were stimulated with 10,000 U/ml IFN-α. Cells were harvested after 8 h, and IFIT1 transcripts were quantified. To determine whether the defective transcription of ISRE-regulated genes was caused by a lower production of type I IFN in the culture or by reduced sensitivity of the older CD4 T cells to the type I IFN stimulus, we stimulated purified naive CD4 T cells in the absence of DC by cross-linking CD3 and CD28 in the presence of increasing concentrations of IFN-α. Results from 12 young and 12 older adults (Fig. 1B) demonstrated a reduced responsiveness in the older adults that was particularly evident at the higher concentrations of type I IFN. Of note, T cells cultured in the presence of type I IFN were less responsive to type I IFN restimulation irrespective of age, suggesting the induction of a negative feedback loop under these conditions. To determine whether the age-associated defect already existed in fresh naive CD4 T cells or whether it was acquired after T cell activation, we compared IFIT1 inducibility in nonstimulated and day 3–activated naive CD4 T cells. No significant difference between young and old adults was seen when IFN responses of fresh ex vivo naive CD4 T cells were compared (Fig. 1C, left panel). Inducibility of IFIT1 expression increased with cell activation and culture, but significantly more so for naive CD4 T cells from young adults (Fig. 1C, right panel), suggesting that old CD4 T cells fail to gain type I IFN responsiveness with T cell activation and differentiation. Type I IFNs transmit their signal through STAT1/2 to activate ISRE-dependent genes. To determine whether JAK-STAT activation is intact in older T cells, we quantified STAT1 phosphorylation by PhosFlow in fifteen 20–35-y-old and fifteen 65–85-y-old individuals after stimulation with 10,000 U/ml IFN-α. No difference was seen when naive unstimulated CD4 T cells were compared (Fig. 2A, left panel). Compared with unstimulated CD4 naive T cells, activated cells respond to type I IFN with more vigorous STAT1 phosphorylation. Naive CD4 T cells activated by anti-CD3/CD28 stimulation for 72 h from older individuals were clearly inferior to phosphorylate STAT1 (Fig. 2A, right panel). Stimulation with increasing doses of IFN-α showed that STAT1 phosphorylation plateaued at concentrations of 5000 U/ml regardless of age. An age-associated reduction in STAT phosphorylation was seen starting at concentrations of 1000 U/ml and could not be overcome by increasing the dose (Fig. 2B). The defect appeared to be specific for type I IFNs, because STAT1 phosphorylation after type II IFN was intact (Fig. 2C). 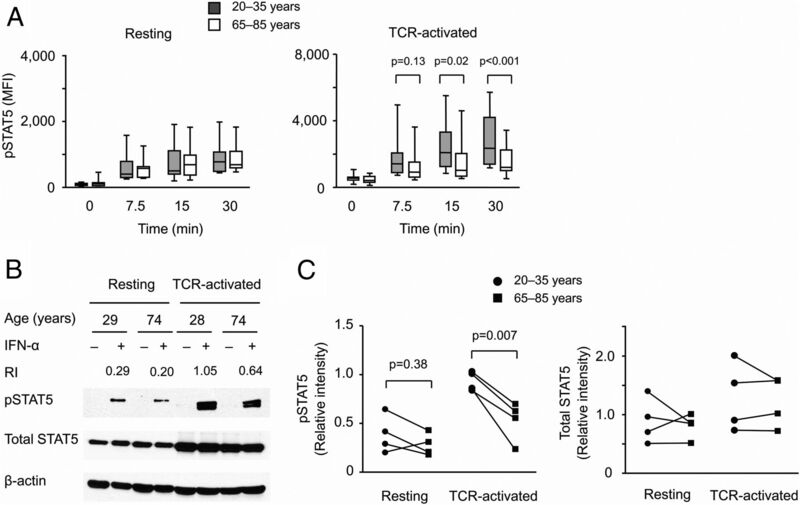 Western blotting confirmed the age-associated reduction in STAT1 responses to IFN-α stimulation in TCR-activated but not quiescent naive CD4 T cells (Fig. 2D). Interestingly, expression of STAT1 was massively increased in T cells activated on day 3, which might explain their increased responsiveness to IFN-α. However, this increase was not reduced with age. STAT1 phosphorylation after type I IFN stimulation of activated naive CD4 T cells declines with age. (A) Resting (left panel, 16 young and 16 older individuals) and day 3 anti-CD3/CD28–activated (right panel, 15 young and 15 older) CD4 naive T cells were treated with 10,000 U/ml IFN-α at 37°C. STAT1 phosphorylation was measured with flow cytometry at the indicated time points. (B) Anti-CD3/CD28–activated CD4 naive T cells from eight young and eight older individuals were stimulated with increasing doses of IFN-α at 37°C for 15 min; STAT1 phosphorylation was measured. (C) Anti-CD3/CD28–activated CD4 naive T cells from five young and five older individuals were treated with 10,000 U/ml IFN-γ at 37°C for 15 min. STAT1 phosphorylation was determined. (D) Resting and anti-CD3/CD28–activated CD4 naive T cells from young and older individuals were left untreated or treated with 10,000 U/ml IFN-α at 37°C for 10 min; phosphorylated STAT1 and total STAT1 levels were determined by Western blotting. Representative blots (left panel) and summary data (right panel) from six young (20–35 y old, circles) and six old (65–85 y old, squares) adults are shown. Samples from a young and an older individual that were cultured and analyzed by Western blotting in parallel are connected by a line. RI, relative intensity of pSTAT1 compared with β-actin. Although the classical type I IFN signaling pathway entails STAT1/2 activation, the type I IFN receptor is promiscuous and activates other STAT pathways (37). STAT5 phosphorylation showed a similar pattern as STAT1—that is, the STAT5 response to type I IFN stimulation was increased in activated CD4 T cells, and this increase was more pronounced in the young than in the old (Fig. 3). STAT5 phosphorylation after type I IFN stimulation of activated naive CD4 T cells declines with age. (A and B) Phosphorylated STAT5 and total STAT5 were determined by flow cytometry (A) in resting (16 young and 16 older) and anti-CD3/CD28–activated (15 young and 15 older) CD4 naive T cells and by Western blotting (B) as described in Fig. 2A and 2D. (C) Summary data from Western blots are from four young (circles) and four older individuals (squares). Paired samples are indicated by a line. 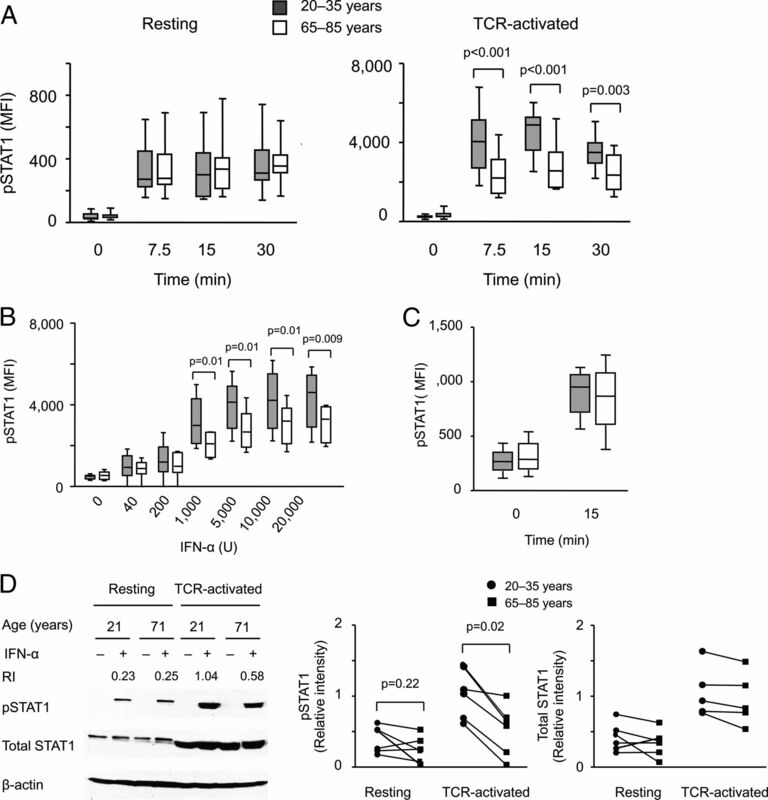 Our analysis so far has shown that activation of CD4 T cells renders them more sensitive to type I IFN stimulation, a process that is attenuated with age. Western blot analysis showed increased expression of STAT1 and STAT5 with activation that did not appear to account for the age-associated difference in responsiveness. To confirm the Western blot data in a larger population of young and older adults, we compared STAT1, and STAT5a, and STAT5b transcripts using qPCR. All three STAT molecules were more highly expressed in activated T cells, however, regardless of age (Fig. 4). Both chains of IFNAR were expressed on naive CD4 T cells. Mean fluorescence intensities increased after activation, however, regardless of age (Fig. 5). Similarly, we did not find a difference in transcription of the negative STAT regulators PTPN6 (SHP-1), SOCS1, SOCS3, PIAS1, and PIASy when activated naive CD4 T cells from young and older individuals were compared (Fig. 6A). Western blot studies corroborated these results (Fig. 6B). Age does not inhibit an activation-induced increase in STAT1 and STAT5 expression. STAT1 and STAT5 transcription were quantified in resting and anti-CD3/CD28–activated CD4 naive T cells from young (shaded boxes, n = 18) and older adults (open boxes, n = 16) by qPCR. Transcript numbers are expressed relative to 1 × 106 18s RNA transcripts. Expression of IFNAR is independent of age. Expression of IFNAR1 and R2 in resting and anti-CD3/CD28–activated CD4 naive T cells was analyzed by flow cytometry. (A) Representative data from a 31-y-old (open histogram) and a 72-y-old (shaded histogram) individual are shown. Dashed lines show IgG control; solid lines show IFN-R. (B) Summary data from 10 young and 10 older individuals are shown. Expression of negative regulators of STAT signaling is independent of age. (A) SHP-1, SOCS1, SOCS3, PIAS1, and PIASy transcription in resting and anti-CD3/CD28–activated CD4 naive T cells from young (shaded boxes, n = 18) and older adults (open boxes, n = 16) were quantified by qPCR. (B) Western blots from resting and anti-CD3/CD28–activated CD4 naive T cells from young and older individuals were prepared as described in Fig. 2D and probed for SHP-1, SOCS1, and SOCS3. Blots shown are representative of four experiments. To examine the type I IFN receptor signaling complex, we precipitated the complex from naive CD4 T cells 3 d after activation and analyzed the precipitate using Western blotting. Precipitation was more efficient after type I IFN stimulation, which was largely independent of age, as can be seen from the staining for IFNAR1 (Fig. 7). Phosphorylated STAT1 and STAT5 were markedly reduced in the precipitates of older CD4 T cells (Fig. 7A). We consistently found increased concentrations of SHP-1 in the precipitates from older T cells (Fig. 7B), whereas the cytoplasmic concentrations were not increased. A careful kinetic analysis of the SHP-1 in the receptor complex showed that in young adults SHP-1 was present before stimulation and was excluded from the complex upon IFN-α stimulation and then returned slowly after 30 min or later (Fig. 7B, right panel). 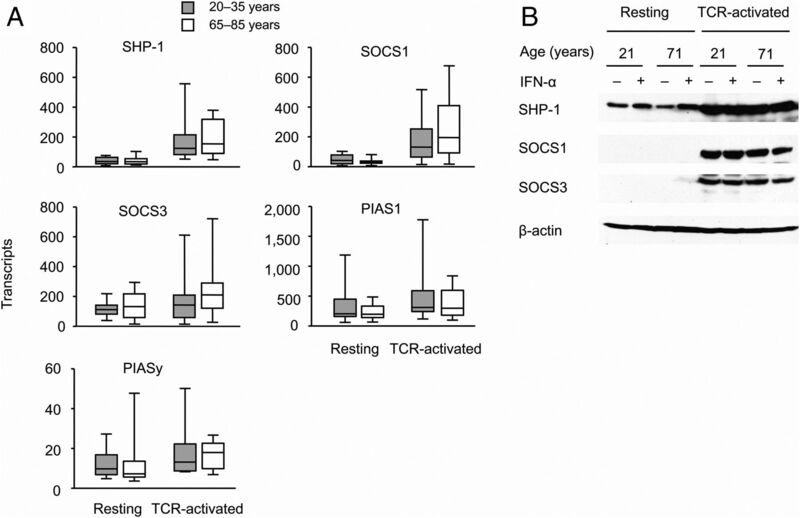 In contrast, CD4 T cells from older adults already exhibited more SHP-1 in the complex before stimulation. More importantly, they were not able to exclude SHP-1 from the signaling complex upon stimulation. SOCS1 did not appear to be enriched in the precipitates from activated older CD4 T cells; however, the concentrations of SOCS1 in the precipitate were too low to be quantified confidently with the currently available commercial Abs (data not shown). 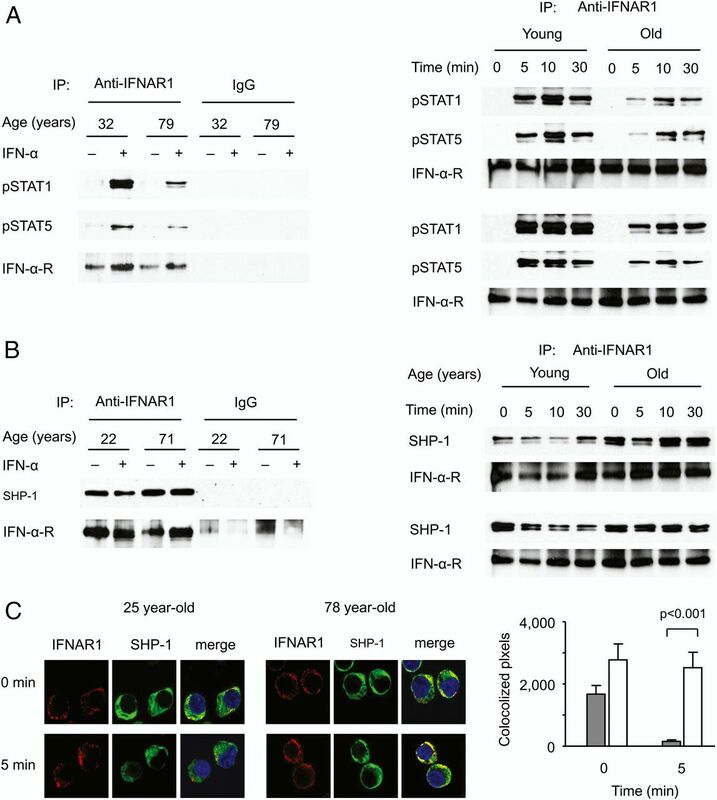 SHP-1 exclusion from the type I IFN receptor signaling complex decreases with age. (A and B) CD4 naive T cells from young and older adults activated with anti-CD3/CD28 mAb for 3 d were stimulated with 10,000 U/ml IFN-α for 10 min (left panels) or indicated times (right panels). IFN receptor complexes were immunoprecipitated and examined by Western blotting. (A) Western blots showing reduced pSTAT1 and pSTAT5 in older adults are representative of three experiments (left panel). In two additional pairs of a young and old individuals, the time courses of phosphorylated STAT1 in the precipitate are shown. (B) Western blots show failure to exclude SHP-1 from the signaling complex after stimulation in older adults. The left panel shows results before and 10 min after IFN-α stimulation and is representative of three experiments. A more detailed time course is shown in the right panel. (C) Colocalization of IFNAR1 (red) and SHP-1 (green) at the cell membrane was examined by confocal microscopy. Representative images (left panel) and mean ± SEM colocalized pixels of 50 cells (right panel) from a 25-y-old and a 78-y-old individual are shown. Original magnification ×630. Data are representative of three experiments. To confirm an age-related difference in SHP-1 recruitment to the signaling complex, we used quantitative colocalization analysis by confocal fluorescence microscopy. CD3/CD28-activated T cells cultured for 3 d in vitro were stained with Abs to SHP-1 and IFNAR1. T cells from older adults exhibit higher colocalization, which, in contrast to young adults, did not significantly decline with IFN-α stimulation (Fig. 7C). Previous studies have reported an important function of type I IFN responses in T cell survival (38, 39). To explore functional consequences of the increased sensitivity of activated T cells from young individuals to type I IFN stimulation, naive CD4 T cells were stimulated with CD3/CD28 cross-linking for 72 h, followed by 3 d of culture with 10,000 U IFN-α before apoptosis rates in proliferating T cells were determined. 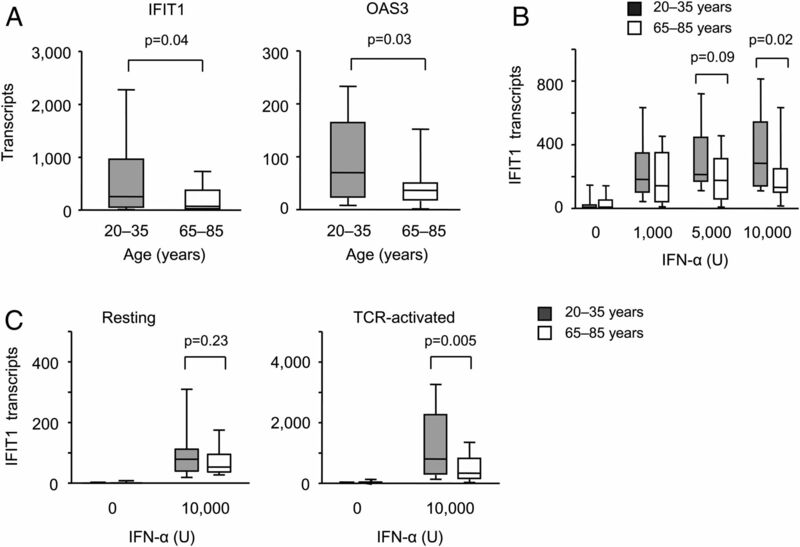 IFN-α was mildly protective for activated T cells from young individuals; a similar effect was not seen for T cells from individuals older than 65 y (Fig. 8A). We explored several pathways that could protect cells from undergoing apoptosis. We did not find a differential induction in antiapoptotic molecules such as Bcl-XL; however, we found a striking difference in the ability to produce IL-2. On day 3 after stimulation, naive CD4 T cells had largely lost the ability to produce IL-2 upon restimulation, more so in old than in young adults, although this trend did not reach significance. IFN-α could restore this defect in CD4 T cells from young individuals, although it was significantly less effective with old T cells (Fig. 8B). Functional consequences of impaired type I IFN signaling in older adults. CD4 naive T cells were stimulated with anti-CD3/CD28 Ab. IFN-α (10,000 U/ml) was added on day 3. Representative original cytometry data for the experiments shown in (A)–(C) are provided in Supplemental Fig. 1. (A) Frequencies of Annexin V and 7-aminoactinomycin D double-positive cells were determined on day 6 in cultures from 15 young and 15 older adults (left panel). The right panel shows ∆ frequencies in cultures with and without added IFN-α. (B) On day 4, cells were restimulated with anti-CD3/CD28 in the presence of Brefeldin A and analyzed for IL-2 production by flow cytometry. Frequencies of IL-2–producing CD4 T cells from 15 young (shaded boxes) and 15 older adults (open boxes) are shown in the left panel. The right panel shows ∆ frequencies in cultures with and without added IFN-α. (C) Type I IFN induction of CD69 in activated CD4 naive T cells from nine young (shaded boxes) and nine older adults (open boxes) is shown in the left panel. The right panel shows ∆ frequencies in cultures with and without added IFN-α. Type I IFN has been reported to inhibit lymphocyte egress from lymphoid tissue after activation, mostly by inducing or sustaining CD69 expression (40). 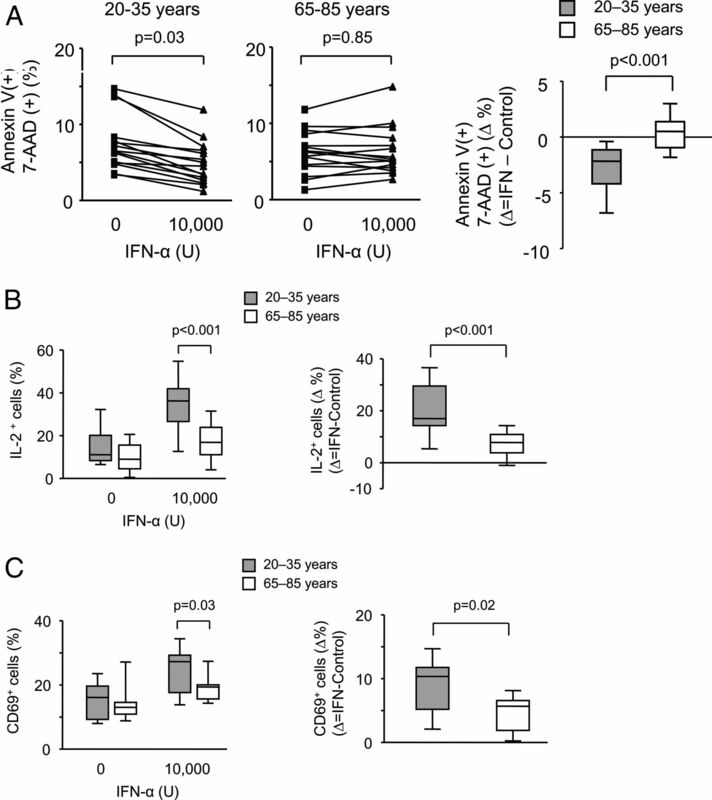 To determine the influence of age on the type I IFN response, naive CD4 T cells activated on day 3 were stimulated with IFN-α for 24 h, and CD69 induction was assessed (Fig. 8C). Activated CD4 naive T cells from young individuals responded significantly better to IFN-α with CD69 expression suggesting that older CD4 T cells are less retained in secondary lymphoid organs after Ag-induced activation. Successful vaccine responses require the activation of Ag-specific T cells by antigenic peptides presented by DC and the subsequent clonal expansion of these T cells and their differentiation into effector cells. Although most of these effector cells undergo clonal contraction, few cells survive as long-lived memory cells constituting the quintessential objective of vaccination. This process is impaired in older individuals (16, 18). Defects in DC activation and early T cell signaling contribute to this failure, and they can be compensated in part with adjuvant-mediated DC activation or increasing the Ag dose (41); however, these interventions have so far not been sufficient to overcome the impaired vaccine responses (42–45). The current studies were built on the hypothesis that age affects the ability of naive T cells to expand and differentiate into effector and memory cells. We found that activated naive CD4 T cells have a blunted response to type I IFN stimulation. This defect impairs IL-2 production and cell survival and may, therefore, have a negative effect on the ability to establish T cell memory. Type I IFNs are key components of the innate immune response rapidly triggered by bacterial and viral infections; therefore, they form a physiologic environment for the evolving adaptive T cell response, in part because plasmacytoid DCs are the major producers of IFN-α. In animal models, these DCs act as an adjuvant enhancing the magnitude of primary and secondary T cell responses (46–50). Studies in mice that lacked the type I IFN receptor selectively on T cells have allowed characterizing the IFN effects in detail. CD8 responses are highly dependent on type I IFN-induced signals, and CD8 memory formation in the setting of LCMV infection in the absence of type I IFN signaling is greatly diminished (51). The role of type I IFN in CD4 T cell responses has been less studied in murine models. However, Ab production after immunization is no longer upregulated by type I IFN if T cells lack the IFN receptor, supporting the notion that Th cell activity is dependent on type I IFN stimulation (52). The effects of type I IFN on T cells are dependent on the timing of the IFN signal in relation to TCR stimulation. Human CD4 naive T cells preincubated with IFN-α show decreased proliferative activities upon TCR triggering, but IFN-α does not inhibit expansion of preactivated T cells (53). Type I IFN curtails phosphorylation of MEK1 and ERK1/2 upon stimulation leading to diminished IL-2 production and IL-2Rα expression in IFN-α pretreated CD4 T cells (54). In contrast, IFN-α upregulates expression of proliferation-promoting genes, including IL-2Rα, c-myc, and pim-1 in activated human T cells (55). As one possible explanation for the different outcomes, type I IFN signaling pathways have been proposed to change with T cell activation. Type I IFN predominantly signals through the JAK-STAT pathway. Receptor occupancy leads to the juxtaposition of TYK2 on IFNAR1 and JAK1 on IFNAR2. The subsequent phosphorylation events recruit and phosphorylate STAT1, STAT3, and STAT5 and, depending on the cell type, STAT4 and STAT6 (56–58). The classical pathway signals through STAT1/2 heterodimers that in association with IRF9 bind to ISRE eliciting a predominantly antiproliferative effect. In mice, T cells after activation switch from the antiproliferative STAT1 signal to STAT4 phosphorylation that is required for IFN-γ induction, whereas STAT3 and STAT5 provide anti-apoptotic signals (59–61). Such a switch was not observed in our studies with human naive CD4 T cells. On the contrary, TCR stimulation induced the expression of STAT1 and STAT5 disproportionately to SOCS1 and sensitized activated T cells to respond to type I IFN stimulation with increased STAT1 and STAT5 phosphorylation, whereas STAT3 and STAT4 did not change. Gene expression arrays of activated T cells after type I IFN stimulation demonstrated the expression of ISRE-responsive genes indicative of the STAT1/2 pathway; quantification of selected ISRE-responsive genes, such as IFIT1 by qPCR in activated versus unstimulated T cells, confirmed this increased responsiveness. The activation-induced sensitization of the STAT1 and STAT5 pathways to type I IFN stimuli was subdued in elderly naive CD4 T cells. Although type I IFN–induced STAT1 and STAT5 phosphorylation in unstimulated CD4 T cells was not influenced by age, naive CD4 T cells from older individuals did not exhibit an increased sensitivity several days after activation to the same extent that was typical for CD4 T cell from young adults. Our data are consistent with the notion that activation of young and less so older T cells is associated with a sensitization to type I IFN signaling through the classical pathways, without which switches in pathway usage contribute to the observed differences. Type I IFN signaling is controlled at several levels. Receptor expression did not change with age. T cell activation induced transcription of STAT1 and STAT5, which might explain the increased IFN responsiveness; however, no age-associated difference was seen. Various phosphatases can dephosphorylate JAK kinases (62–65). SOCS inhibits STAT activation proximally through several mechanisms (66–69). We found SOCS1 and SOCS3 to be induced by activation, but not to a higher degree in T cells from older individuals. PIAS proteins function as more distal STAT inactivators (70, 71). Again, no age-dependent difference in PIAS transcription was seen. Immunoprecipitation experiments identified an age-associated difference in the presence of SHP-1 in the signaling complex. SHP-1 has been shown to be an important regulator of type I IFN signaling, presumably by dephosphorylating JAK1 and not TYK2 (62). SHP-1, generally binding with its SH2 domain to phosphotyrosines in cell surface receptors, can directly bind to JAK1 (65). Consistent with observations by David et al. (62) in mouse macrophages, we found SHP-1 to be present in the IFN receptor complex of activated CD4 T cells before IFN-α stimulation; it was rapidly excluded upon IFN binding. A SHP-1–mediated dephosphorylating activity on JAK kinases would explain that both STAT1 and STAT5 phosphorylation were reduced in activated naive CD4 T cells from older individuals. The cause for the lack of SHP-1 exclusion from the receptor complex in older individuals remains to be elucidated. Type I IFN stimulation of activated T cells has a plethora of functional consequences that are important for effector cell differentiation and memory formation (72). We did not observe increased antiproliferative effects of STAT1/2 signaling in the young as one might have suspected from the increased STAT1 signaling. Type I IFNs are known to function as a survival factor for activated T cells, which may be important to counteract clonal downsizing and to favor memory cell survival (38). Conversely, type I IFNs might also deliver proapoptotic signals, possibly through the induction of FasL or TRAIL (73–76). In our system, we demonstrated an antiapoptotic effect of type I IFN on activated T cells in vitro that was reduced in older adults, consistent with impaired IFN signaling. Perhaps more importantly, we find that type I IFN stimulation enables activated CD4 T cells to produce IL-2 upon restimulation. Again, this effect was seen more in young than in older CD4 T cells. Increased IL-2 production would not only contribute to the survival of activated CD4 T cells themselves, but also support the clonal expansion of Ag-specific CD8 T cells. Finally, type I IFNs are important to retain activated T cells in lymphoid tissues by upregulating and sustaining CD69 expression that inhibits sphingosine 1-phosphate receptor-1 function (40). Indeed, type I IFN was less able to induce CD69 expression in activated naive CD4 T cells from older than from young adults. Because sustained CD69 expression will delay lymphocyte egress from lymphoid tissue and thereby promote T cell differentiation and lymphoid follicle formation, this defect could greatly contribute to the impaired adaptive immunity in older individuals. T cell responsiveness to type I IFN, commonly produced in viral and bacterial infections, is known to be pivotal for the generation of adaptive immune responses. Our findings identify a defect in the IFN signaling pathway in the elderly that may contribute to reduced T cell responses. The increased threshold to IFN stimulation of activated naive CD4 T cells renders older individuals more resistant to the activity of this cytokine. Increased type I IFN stimulation may be able to overcome this defect, but needs to be carefully timed. Based on our data, type I IFN responses are needed in T cells several days after the initial antigenic stimulation, whereas type I IFN in the early stages of T cell activation will induce the activation of negative feedback loops and likely be counterproductive. This work was supported by National Institutes of Health Grants U19 AI090019, R01 AG015043, U19 AI057266, and R01 AI108891 (to J.J.G.) and Grants R01 AI044142, R01 AR042527, and P01 HL058000 (to C.M.W.). The online version of the article contains supplemental material.
. 2007. Immunosenescence: deficits in adaptive immunity in the elderly. Tissue Antigens 70: 179–189.
. 2013. Causes, consequences, and reversal of immune system aging. J. Clin. Invest. 123: 958–965. 2014. Aging of the T cell compartment in mice and humans: from no naive expectations to foggy memories. J. Immunol. 193: 2622–2629.
. 2015. Naive T cell maintenance and function in human aging. J. Immunol. 194: 4073–4080.
. 2003. Mortality associated with influenza and respiratory syncytial virus in the United States. JAMA 289: 179–186.
. 2008. Mouse-passaged severe acute respiratory syndrome-associated coronavirus leads to lethal pulmonary edema and diffuse alveolar damage in adult but not young mice. Am. J. Pathol. 172: 1625–1637.
. 2009. Key role of T cell defects in age-related vulnerability to West Nile virus. J. Exp. Med. 206: 2735–2745.
. 2011. Age-related increases in PGD(2) expression impair respiratory DC migration, resulting in diminished T cell responses upon respiratory virus infection in mice. J. Clin. Invest. 121: 4921–4930.
. 2013. West Nile virus: review of the literature. JAMA 310: 308–315.
. 2003. Clinical progression and viral load in a community outbreak of coronavirus-associated SARS pneumonia: a prospective study. Lancet 361: 1767–1772.
. 2007. Risk factors for West Nile virus neuroinvasive disease, California, 2005. Emerg. Infect. Dis. 13: 1918–1920.
. 2007. Effectiveness of influenza vaccine in the community-dwelling elderly. N. Engl. J. Med. 357: 1373–1381.
. 2007. Immunosenescence: role and measurement in influenza vaccine response among the elderly. Vaccine 25: 3066–3069.
. 2013. The gracefully aging immune system. Sci. Transl. Med. 5: 185ps188.
. 2013. Systems biology of vaccination in the elderly. Curr. Top. Microbiol. Immunol. 363: 117–142.
. 2013. Understanding immunosenescence to improve responses to vaccines. Nat. Immunol. 14: 428–436.
. 2014. Mechanisms shaping the naïve T cell repertoire in the elderly - thymic involution or peripheral homeostatic proliferation? Exp. Gerontol. 54: 71–74.
. 2010. Loss of naive T cells and repertoire constriction predict poor response to vaccination in old primates. J. Immunol. 184: 6739–6745. 2014. Diversity and clonal selection in the human T cell repertoire. Proc. Natl. Acad. Sci. U S A 111: 13139–13144.
. 2011. Age-related deficiencies in antigen-specific CD4 T cell responses: lessons from mouse models. Aging Dis. 2: 374–381.
. 2012. Aged-related shifts in T cell homeostasis lead to intrinsic T cell defects. Semin. Immunol. 24: 350–355.
. 2014. CD4 T cell defects in the aged: causes, consequences and strategies to circumvent. Exp. Gerontol. 54: 67–70.
. 2009. Tumor suppressor mechanisms in immune aging. Curr. Opin. Immunol. 21: 431–439.
. 2008. Age-dependent signature of metallothionein expression in primary CD4 T cell responses is due to sustained zinc signaling. Rejuvenation Res. 11: 1001–1011.
. 2004. T cells from elderly persons respond to neoantigenic stimulation with an unimpaired IL-2 production and an enhanced differentiation into effector cells. Exp. Gerontol. 39: 597–605.
. 2012. Decline in miR-181a expression with age impairs T cell receptor sensitivity by increasing DUSP6 activity. Nat. Med. 18: 1518–1524.
. 2012. Signal inhibition by the dual-specific phosphatase 4 impairs T cell-dependent B-cell responses with age. Proc. Natl. Acad. Sci. USA 109: E879–E888.
. 2006. Interferon signalling network in innate defence. Cell. Microbiol. 8: 907–922.
. 2000. Type 1 IFN maintains the survival of anergic CD4+ T cells. J. Immunol. 165: 3782–3789.
. 2013. Perspectives on vaccine development for the elderly. Curr. Opin. Immunol. 25: 529–534.
. 2010. Vaccines with MF59 adjuvant expand the antibody repertoire to target protective sites of pandemic avian H5N1 influenza virus. Sci. Transl. Med. 2: ra5.
. 2007. Safety and immunogenicity of a high dosage trivalent influenza vaccine among elderly subjects. Vaccine 25: 7656–7663.
. 2005. A vaccine to prevent herpes zoster and postherpetic neuralgia in older adults. N. Engl. J. Med. 352: 2271–2284.
. 1996. The neglected role of type I interferon in the T-cell response: implications for its clinical use. Immunol. Today 17: 369–372.
. 2000. Type I interferon as a powerful adjuvant for monocyte-derived dendritic cell development and activity in vitro and in Hu-PBL-SCID mice. J. Exp. Med. 191: 1777–1788.
. 2008. Type I interferons as vaccine adjuvants against infectious diseases and cancer. Expert Rev. Vaccines 7: 373–381.
. 2006. Cutting edge: enhancement of antibody responses through direct stimulation of B and T cells by type I IFN. J. Immunol. 176: 2074–2078.
. 2003. Down-modulation of responses to type I IFN upon T cell activation. J. Immunol. 170: 749–756.
. 2000. IFN-alpha 2b reduces IL-2 production and IL-2 receptor function in primary CD4+ T cells. J. Immunol. 164: 2296–2302.
. 1999. Interferon-alpha activates multiple STAT proteins and upregulates proliferation-associated IL-2Ralpha, c-myc, and pim-1 genes in human T cells. Blood 93: 1980–1991. 2010. Type I interferon: friend or foe? J. Exp. Med. 207: 2053–2063.
. 2013. The regulation of inflammation by interferons and their STATs. JAK-STAT 2: e23820.
. 2014. Regulation of type I interferon responses. Nat. Rev. Immunol. 14: 36–49.
. 2002. Critical role for STAT4 activation by type 1 interferons in the interferon-gamma response to viral infection. Science 297: 2063–2066.
. 2005. Cutting edge: role of STAT1, STAT3, and STAT5 in IFN-alpha beta responses in T lymphocytes. J. Immunol. 174: 609–613.
. 2013. Changing partners at the dance: Variations in STAT concentrations for shaping cytokine function and immune responses to viral infections. JAK-STAT 2: e23504.
. 1995. Differential regulation of the alpha/beta interferon-stimulated Jak/Stat pathway by the SH2 domain-containing tyrosine phosphatase SHPTP1. Mol. Cell. Biol. 15: 7050–7058.
. 1999. Shp-2 tyrosine phosphatase functions as a negative regulator of the interferon-stimulated Jak/STAT pathway. Mol. Cell. Biol. 19: 2416–2424.
. 2005. Inhibition of IFN-alpha signaling by a PKC- and protein tyrosine phosphatase SHP-2-dependent pathway. Proc. Natl. Acad. Sci. USA 102: 10267–10272.
. 2004. Inhibitors of cytokine signal transduction. J. Biol. Chem. 279: 821–824.
. 2007. SOCS proteins, cytokine signalling and immune regulation. Nat. Rev. Immunol. 7: 454–465.
. 2007. IFN-alpha-induced signal transduction, gene expression, and antitumor activity of immune effector cells are negatively regulated by suppressor of cytokine signaling proteins. J. Immunol. 178: 4832–4845.
. 2008. Putting out the fire: coordinated suppression of the innate and adaptive immune systems by SOCS1 and SOCS3 proteins. Immunol. Rev. 224: 265–283.
. 2011. Suppressor of cytokine signaling (SOCS) 1 inhibits type I interferon (IFN) signaling via the interferon alpha receptor (IFNAR1)-associated tyrosine kinase Tyk2. J. Biol. Chem. 286: 33811–33818.
. 2003. PIAS proteins promote SUMO-1 conjugation to STAT1. Blood 102: 3311–3313.
. 2004. PIAS1 selectively inhibits interferon-inducible genes and is important in innate immunity. Nat. Immunol. 5: 891–898. 2012. Modulation of T-cell function by type I interferon. Immunol. Cell Biol. 90: 492–497.
. 1999. Type I interferons (IFNs) regulate tumor necrosis factor-related apoptosis-inducing ligand (TRAIL) expression on human T cells: A novel mechanism for the antitumor effects of type I IFNs. J. Exp. Med. 189: 1451–1460.
. 2001. Involvement of TRAIL/TRAIL-R interaction in IFN-alpha-induced apoptosis of Daudi B lymphoma cells. Cytokine 14: 193–201.
. 2005. Interferon-beta-induced activation of c-Jun NH2-terminal kinase mediates apoptosis through up-regulation of CD95 in CH31 B lymphoma cells. Exp. Cell Res. 304: 518–530.
. 2013. Type I interferon upregulates Bak and contributes to T cell loss during human immunodeficiency virus (HIV) infection. PLoS Pathog. 9: e1003658.